Fantastic savings and big discounts on last minute self-catering rentals across UK. Spring into action and book now to guarantee your holiday at the best price and avoid disappointment! Are you feeling spontaneous and want to get away with your friends? We will show you discounted large holiday houses at last minute prices - search and compare rates for last minute holiday cottages. The last minute rental deals will surprise you. Do you want to have quality time with your best friends? - sound good then book now! If you are able to get away in the foreseeable future, you can take advantage of these great value late deals at holiday houses throughout UK. What's the best time / cheapest time of year for last minute holiday houses? Tricky to say - there is no best time for last minute rentals - it's all about timing and luck! Holiday home owners need to rent out their property in low and high season so will offer late deals at discounted prices to fill gaps or cover cancellations. For this reason there are usually holiday homes with late availability most of the year around. But the really cheap rentals will possibly be last minute holidays in the low season - you are also more likely to find late availability during these winter months. Peak holiday season - such as summer holiday months - July, July and August, or half term school holidays usually get booked up to a year in advance, so late availability during these times will be much harder to find. In the winter month low season, you are more likely to find a property that is simply still available, unless of course a house has a last minute cancellation - it does happen, so look and you may grab a bargain in the summer! Do you fancy taking some time out and having a last minute break? ‘Staycations’ are increasingly popular in the UK - without air travel, the UK offers superb holidays that can be taken at short notice, there are a great selection of last minute offers to cater for every occasion. Discounts in the travel industry are often associated with early bookings - but for holiday rental properties it's more about late availability discounts. Large holiday cottages and houses with last minute bargains can be found today! How much notice do you need - a week or a day? 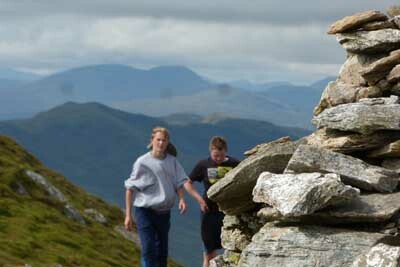 Jump into action - leave the city and climb a mountain tomorrow! Amazing reductions can be found on all kinds of large group accommodation, generally the more last-minute the deal, the bigger the discount and the cheaper the price - representing fantastic savings and great value for money. The biggest advantage of a last minute holiday let is the price! - Discounted rates are often given for late bookings. Self-catering cottages with late deals and 'Special Offers' for weekends, mid week breaks and weekly rentals are published by date so when you search you may see a selection of cottages offering late availability - take the opportunity to grab a bargain holiday house. If you want to go skiing, guarantee snow with a last minute ski holiday in Scotland - check the live weather cams at Glenshee or Aviemore and head off for the powder, there are lots of holiday cottages in Scotland close to the ski resorts. Quick booking is recommended to snap up cheap, discounted late availability bargains. Last minute deals are to be found, we are open on-line 24/7 - talk holidays to your friends and get away on a late availability deal. Large rental property in Gloucestershire near Stroud with 6 bedroom, sleeps 18, Pets friendly, Ground Floor Facilities, Pub within 1 mile, Wifi. Big house for a holiday in North Yorkshire near Whitby with 8 bedroom, sleeps 16, Pets friendly, Barbecue, Pub within 1 mile, Wifi, Cot Available, Coastal Property. Luxury holiday house in Norfolk near Wells-next-the-Sea with 6 bedroom, sleeps 12, Pets friendly, Ground Floor Facilities, Pub within 1 mile, Cot Available, Coastal Property. Big party house in North Yorkshire near Staithes with 5 bedroom, sleeps 12, Pets friendly, Ground Floor Facilities, Pub within 1 mile, Cot Available, Coastal Property.